Sometimes, you may have a pretty good idea about which variables and constraints are the most relevant to consider, if you want to make changes to your design. Other times this will only become apparent through a trial and error process – sometimes not at all. Especially when the number of variables and objectives increase, this task becomes extremely difficult. Now, CORTIME will determine the most important parameters for you, by performing a sensitivity analysis using the same data that drives the CORTIME DoE and Response Surface. Practically this means that you can both identify important parameters and parameters of minimal significance. 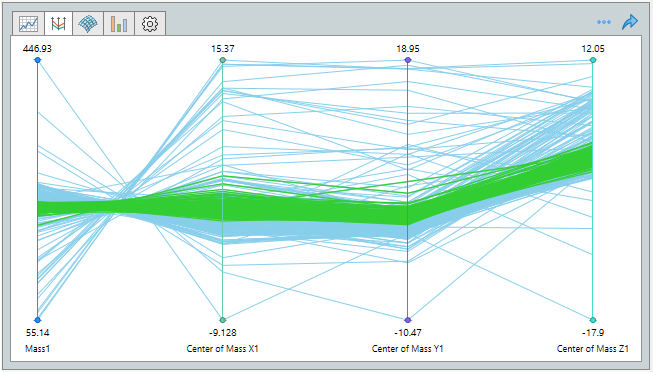 You can find the Sensitivity Analysis tool in its own tab in the Optimization section and the data viewer. Just pick a dataset made using the DoE algorithm and analyse your parameters with the different heuristics available. As you can see, the Sensitivity Analysis tool identifies how much a variable alteration influences an objective by using the data from the CORTIME DoE. Each color belongs to an objective which neatly gives you an overview of each objectives relationship with each variable. This can give you invaluable data in determining which parameters you should focus on the most, for singling out variables that may be eliminated from your design optimization without significant loss. Aside from providing valuable information about your design, it can also save valuable time when it’s time to really crunch the numbers. I desperately want to try that! 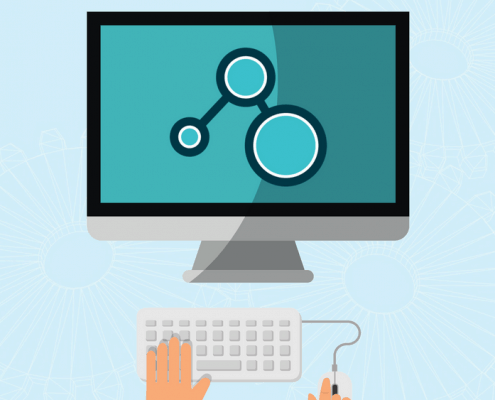 Have you ever had the notion that your data analysis tools are holding you back? That two-dimensional (or even three-dimensional) graphs just isn’t enough to give you the best overview of your design parameters? CORTIME’s PC graph is a great tool for analysing your data within strict box-boundaries of each individual objective or specification. But sometimes you want to find an appropriate balance between different specifications, the box-boundaries would leave too many non-optimal data points to sort through. We have now found a resolution for this problem by adding a Polygon Filter for the scatter plot. You select datapoints by drawing a polygon in freehand. This allows you to mark data points close to the pareto front, or that matches a certain relationship. Note that the polygon filter becomes available in the scatter plot after enabling the additional settings panel. Here the Polygon Filter is used to single out a variety of iterations which lies in an optimal area. The polygon filter makes it easy to study e.g. the points that lie on the pareto front of the optimization. I.e. the points where you must make sacrifices in one objective in order to gain in another. The marked datapoints are automatically highlighted in the PC-graph, so that you can easily view their relationship and perform subsequent filtering and selection. The same iterations as shown above are then highlighted with a green color in the PC-graph, which makes them easier to analyze. Very useful - let’s start that trial! If you already know that your design is fairly close to an ideal solution, you can run a local algorithm in CORTIME. It will predominantly focus on immediate improvements to your original design, which means it is much faster than a global algorithm. But until now, you have only been able to optimize a single objective with the local algorithm. Multi-objective optimization has exclusively been possible with the global algorithm, which explores a much larger solution space. The global algorithm is specially tailored to solve complex problems with lots of variables and objectives, and for robustly handling any kind of simulation data, whether it be noisy, oscillating, discrete, continuous, non-linear etc. It is a reliable tool, but the methods it applies, to ensure robustness, comes at a cost: The number of iterations is comparatively high when working with simpler problems. Many problems you encounter will be relatively simple in a CAO context, and bringing in the heavy artillery might be overkill, or even outright infeasible if your simulation time is high and time is a restricted resource. This GIF illustrates how the local algorithm (also known as Nelder Mead) works. It homes in on the first optimal it finds and rarely explores alternatives. But don’t worry: CORTIME compensates for that by restarting the algorithm in different places. Now, our local optimization algorithm has also been fitted with the gears and levers to handle multiple objectives. You can now select between a “Global” as well as “Local” algorithm, for direct optimization. These were previously named “Multi-objective” and “Single-objective” respectively. The local algorithm homes in on improvements to the starting design much more aggressively than the global; always rejecting suggestions that do not improve on the objectives. This means it can converge in much fewer steps under the right conditions. The fact that it is now capable of handling multiple objectives means, that it much more frequently will be a viable tool for your problem, and it allows you to balance the need for robustness with any time restrictions your project might have. This is what I’ve been waiting for - give me that trial! A number is not just a number in neither CAE nor CAO. Whether a given number represents an area, a length, a force, SI units or IPS units really matters. Just ask the people who programmed the Mars Climate Orbiter. Previously you had to remember or look up the units of your CORTIME resources elsewhere in SolidWorks. Those days are over. 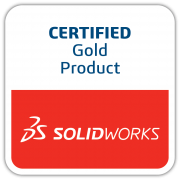 CORTIME now shows the units of most of the resources available from SolidWorks. This will make it easier to set up constraints and evaluate your data, especially older data. Units are shown to the right of every resource that allows add-ins to enquire about its units. Have in mind that some resources may require that you first perform a simulation or a rebuild, before they are updated. The units will also be stored with optimization data, so that when you look at older data files, you are sure what the numbers represent. What might seem like a small addition, will make all the difference once you start working with the new version of CORTIME. No more going back and forth between the Mass Properties Manager and CORTIME. The units will be visible wherever you use them in the task pane of CORTIME – just another step in CORTIME saving more of your precious development time. As you can see the proper units are now placed in a parentheses behind every objective. Nifty - let me try it out! CORTIME can now reliably handle more than one Flow project in multi-study mode. 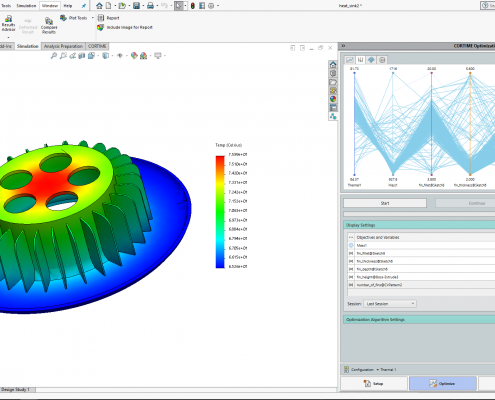 This means you can optimize on several configurations/conditions of your problem at the same time, and you can even combine it with analysis from the SolidWorks Simulation add-in. This grants you unprecedented power over your simulation-based design optimizations. The support for simulation Loads and Restraints have been extended, giving you more options for controlling your boundary conditions as a part of your optimization. The scatter plot has been equipped with a toolbar where some new features – the aforementioned polygon filter in particular – can be activated. 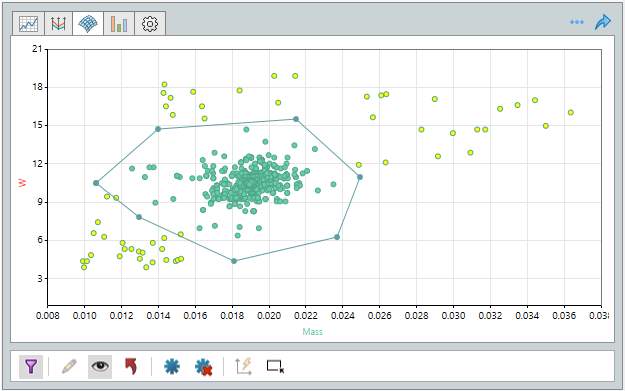 To show the toolbar in the taskpane, simply click the three dots in the top right of the scatter plot. 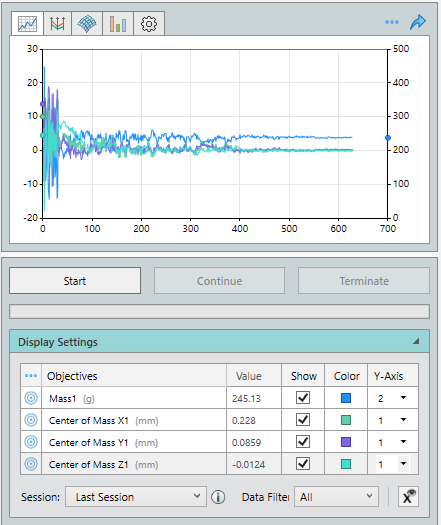 You can now save display settings to a register, in order to quickly summon different configurations of variables and objectives in your analysis tools. The number of examples in the help section has expanded. Several minor issues that may have roughed up your otherwise smooth-sailing experience with CORTIME have been identified and fixed. We would like to thank our community for not being too shy to reach out, and thereby helping us to quickly identify the issues. All of this sounds awesome - let me try CORTIME already! Show me what else CORTIME can do!